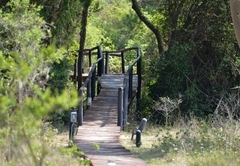 Bushlands Game Lodge is a KwaZulu Natal game lodge providing a wildlife experience for tourists visiting Zululand. Within 300 acres of bush and game and 300,000 acres of National Parks, you will find Bushlands Game Lodge. Experience a magical safari retreat where the wild run free. Designed to blend seamlessly with its surrounds, Bushlands Game Lodge exudes a magnificent ambience of a naturally unspoilt environment. Small game such as warthog, nyala, impala, wildebeest and many other animals and birds enjoy Bushlands Game Lodge’s peaceful ambience. 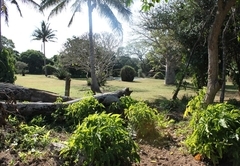 Animals are often found wandering free through the property whilst guests are enjoying a scrumptious breakfast or romantic dinner amidst a moon-lit night and amazing stars. 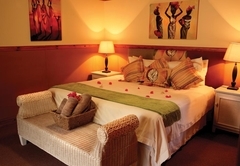 Bushlands Game Lodge offers accommodation in Hluhluwe in 21 spacious air conditioned rooms. 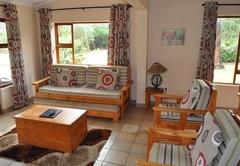 Each room is elegantly furnished and en-suite with tea / coffee making facilities. 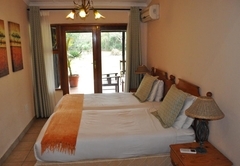 The interior decoration of the rooms compliments the beautiful natural bush surroundings. 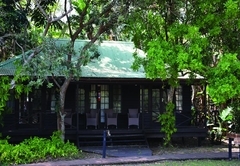 These rooms have been refurbished and specially upgraded to entertain guests with a unique African experience while enjoying the luxuries of a three-star lodge. The bathrooms and showers have all been redone, and brand new furniture provides premium comfort for guests to indulge in the tranquil surroundings. 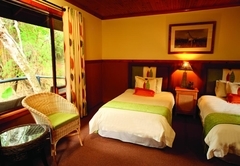 All rooms and bedding bring a unique ethnic touch creating an atmosphere filled with rich brown, green and auburn colours. 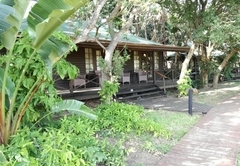 The rooms are connected by raised wooden walkways which lead to the main dining room, bar and swimming pool. 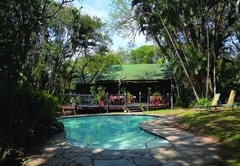 The restaurant terrace overlooks the pool area and beautiful surrounding bush life. 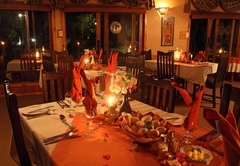 Meals can be enjoyed in the main dining room or under a picturesque African star-filled night. At Bushlands, atmosphere is everything, and resident chefs are renowned for preparing mouth-watering venison dishes, after which guests can enjoy a relaxing retreat in the boma where a fire and friendly atmosphere awaits. 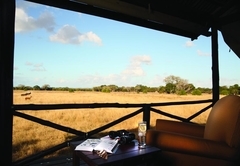 Bushlands Game Lodge, situated on 300 acres of bush and game, reflects a true African identity which has inspired its people since beginning of man-kind. Its people share an undying passion for the land and her animals, and love sharing this passion among travelers as well as with each other. 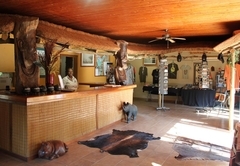 Bushlands Game Lodge’s convenient location makes it a popular setting where guests may easily visit the nearby attractions and Game Parks. 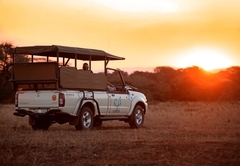 Set off on a Game Drive and experience the majestic “Big Five” on their. Carefully observe the wise African Elephant, the proud Buffalo, the dominant Rhino, the nocturnal Leopard and the majestic African Lion. 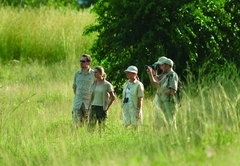 Bushlands Game Lodge offers daily Game Drives or walks as well as Bird Watching trails. 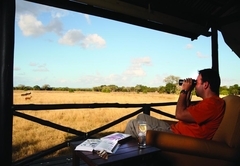 Enjoy a sundowner at the boma viewing deck overlooking the waterhole, and await the animals gathering to rejuvenate themselves after a day in the African sun. Room with a Double Bed and en-suite Bathroom. 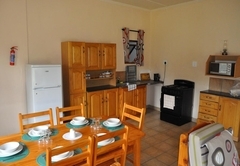 Each room is elegantly furnished and en-suite with tea / coffee making facilities. The bathrooms and showers have all been redone, and brand new furniture provides premium comfort for guests to indulge in the tranquil surroundings. Room has either two double Beds or two three-quarter beds with en-suite bathroom. 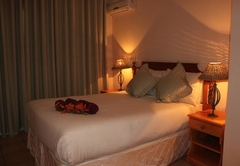 Each room is elegantly furnished and en-suite with tea / coffee making facilities. The bathrooms and showers have all been redone, and brand new furniture provides premium comfort for guests to indulge in the tranquil surroundings.